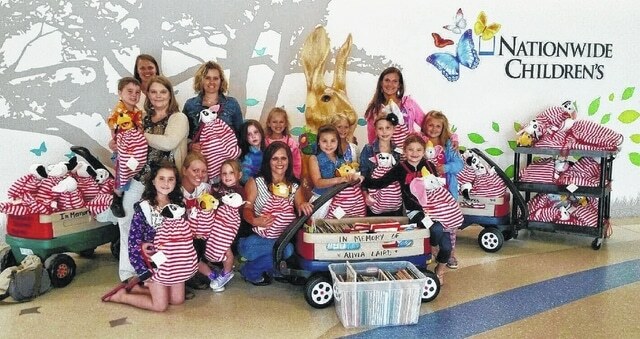 Urbana area Girl Scout Troop 34100 donated various items to Nationwide Children’s Hospital in Columbus on June 29. Pictured in the lobby of the hospital are, left to right, front row, Madison McAlexander, Troop Co-Leader Nicole Dixon, Braelyn Roosa, Culley Laird, Mya Laird, Camri Lantz, Alex Dixon, Lani Dingledine, middle row, Michael Nannarone, Sarah Nannarone, Co-Leader Brittany Lantz, Chloe Nannarone, Alayna Stacy, Morgan Boyd, Heather Dingledine, back row, and Amie Boyd. Members of Urbana area Girl Scout Troop 34100 visited Nationwide Children’s Hospital in Columbus on June 29 not to sell cookies, but to donate a wagon, books and “chemo comfort bags” in memory of Alivia Laird, a local child who spent time at Children’s before losing her battle with cancer on June 29, 2012. Troop Co-Leader and Urbana City Schools paraprofessional educator Brittany Lantz said after the troop wrapped up its annual cookie sale earlier this year, the girls decided to give to those in need. Knowing fellow Girl Scout Mya Laird had lost her twin sister, Alivia, to cancer three years ago, the troop decided to help patients at Nationwide Children’s Hospital. After collecting new and used books as well as monetary donations for several months, the troop made the journey to Columbus with over 200 new and used books, a Little Tikes wagon to help transport patients around the hospital, and 100 “chemo comfort bags” filled with a variety of items for patients recovering from treatment. Lantz said Mrs. Anders’ kindergarten class at North Elementary donated 100 new Scholastic books for the bags, while the other new and used books were donated by the troop, Urbana City Schools teachers and others in the community. The troop received donations from national retailers Walmart, Kohl’s and Target, as well as from a number of local businesses, including Civista, Security National Bank, Donay Life & Wellness Center, Lani Anders Angel Foundation, Frans Mowing, Hometown Music, Pam’s House of Beauty, Graves-Crosby-Sellman Insurance, State Farm, Peoples Savings Bank, Long Road CrossFit, Lantz Sales, Airport Cafe, KTH, Team Ellie, Dr. Bohl and Bauer DDS, and the Medicine Shoppe. “Without these businesses and donations from others in the community, 100 bags would not have reached the young patients at Nationwide Children’s Hospital,” Lantz said. Lantz said when they arrived at the hospital on June 29, a staff member met them at the lobby doors with carts and wagons, which the troop quickly overfilled with donations. The experience also left a lasting impression on the Scouts. “Knowing that we were celebrating the life that Alivia had lived and her time spent at Nationwide Children’s Hospital ended up showing the girls how much giving means to those in need,” Lantz said. “I hope the girls in the troop have a true understanding of how big of a difference they are making in people’s lives by helping and donating to organizations like this.